Pandit Karuppan was a poet, a dramatist, and a social reformer who lived in the Ernakulam district of Kerala. Through his relentless struggle, he emerged as a crusader against the caste discrimination and other social evils that existed in the state during his lifetime. Pandit Karuppan was usually referred to as Lincoln of Kerala by his critics and friends. He got this name for steering forward the members of lower castes socioeconomically and educationally. Though he hailed from a fishermen community, he did not pursue his career in fishing. Instead, he educated himself and became a Sanskrit scholar, a poet and a reputed dramatist. Using his skills in literary field, he wrote extensively against illiteracy, social inequality, casteism and superstitions. He used his organizational skills to educate the people about these social evils and equip them to fight against them. K.P. Karuppan was born on May 24, 1885 into a lower middle class family of Dheevara fishermen community. His place of birth was Cheranelloor in Ernakulam district of Central Kerala. His parents were Paapu and Kochu Pennu. Karuppan was born into a family that had traditional skills in toxicology. Hence, the family members were known to treat the snakebite victims successfully. The Pandit Karuppan's original name was Shankaran. The name Karuppan was given to him by a Tamil Gosai who happened to be his family friend. This Tamil Gosai had predicted that young Karuppan would become an accomplished scholar one day, and hence he called the young boy Karuppan. The young Karuppan began his formal education under the tutelage of Azheekkal Velu Vaidyan who was his relative. Subsequently, he learned the basics of Sanskrit language such as Amarakosham, Sidharoopam, and Sreeramodantham under another Guru Vadakke Valath Appu Asan. After having learned the preliminary basics of Sanskrit language, the young Karuppan started reading Ithihaas and Puranas and acquired mastery in both of them. His first literary work was a poem by the name Sthothramandaaram. This poem was written by him when he was a young boy. By writing another work Lankamandaram at the tender age of 12 years, he surprised his teachers. This work had slokas stylized in Shardoolavikreeditham. This was a feat in itself, considering the age of the writer. When he grew up, Karuppan studied Sanskrit Kavyas under the watchful eyes of Mangalappillil Krishnan Asan. After successfully completing his studies in Kavyas, he returned to his hometown and resumed his studies in Sanskrit under the tutorship of Annamananda Rama Pothuval. While studying under Annamananda Rama Pothuval, he had to face the stiff resistance from the students who belonged to upper caste families. Hence, he had to sit at a corner of the class to listen to the discourse of his Guru. In a short span of time, he completed the study of Kavyas Makham and Nyshadham, and Bhoja Chempu from Rama Pothuval. The young Karuppan completed the rest of his training in basics of the Sanskrit language in Kodungalloor. According to him, the learning in Kodungalloor Kovilakam was a different experience. At this place, he had learned the language directly from the luminaries of the Sanskrit language. The budding talent in Karuppan was noticed by Rajarshi Ramavarma Raja who was the Maharajah of Cochin. When Maharajah of Cochin came for worshipping at Thiruvanchikulam Siva Temple, Karuppan was introduced to him by Bhattan Thampuran. After the meeting, there was a friendly talk between the Maharajah and Karuppan. This friendly meeting was the turning point in the life of Karuppan. After the meeting, Maharajah was impressed with Karuppan's knowledge base and invited him to Tripunitura Palace. At Tripunitura Palace, Karuppan was given an advanced training in Sanskrit language by 'Sahridayathilakan' Rama Pisharody who was the Principle Guru of the Royal family. 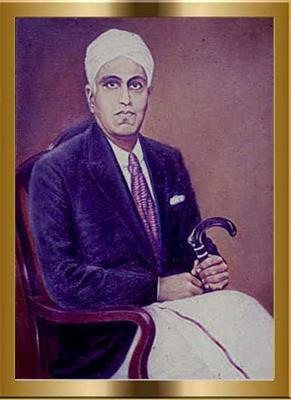 Under him, Karuppan studied Sidhantha Kaumudi, Sanithee Darpanam, and Manorama. Soon after the completion of the training, Karuppan was appointed as a Sanskrit Teacher at St. Therasa's Convent Girls' High School in Ernakulam. Initially, Karuppan's appointment as a teacher was not accepted by the upper class parents of the girls studying in the Caste Girls' High school. Knowing the caliber of Pandit Karuppan, the Maharajah of Cochin overruled the protest by sending a stern message to the parents of the children that their children would be thrown out of the school if they persist with the non-cooperation movement. This abruptly ended the protest by the upper class members. When the students started to attend the classes of Pandit Karuppan, they started to like the subject taken by him. After teaching for a while in Caste Girls' High School, he was transferred to Thrissur-based Victoria Girls' High School in 1918. Subsequently, he was posted to Teacher Training School on a higher grade. Finally in 1921, Karuppan was transferred back to the Girls' High School where he faced the protests from higher castes initially. The school by then had dropped the 'Caste" from its name. When he was working as a teacher at the Girls' High School for the second time, Pandit Karuppan was nominated as a member of the Cochin Legislative Council to represent the lower castes from his constituency. This nomination was done in recognition of his strenuous struggle for improving the lives of the people who had been sidelined due to the caste-based discrimination. As a member of the Cochin Legislative Council representing the lower caste people, he presented their plight to the authorities concerned with conviction and purpose. As a result of this representation, a separate department was established to look after the welfare of these people. This department was named as the Department for the Protection of Depressed Classes. The department had Rao Sahib C. Mathai as its ex-officio Protector and Pandit Karuppan as its full-time Assistant Protector. As an Assistant Protector in the department, Pandit Karuppan initiated a number of landmark reforms to improve the living conditions of the depressed classes. These included the plans to start schools and colonies. Through the series of representations, he managed to convince the authorities to institute scholarships and fee concessions for the benefit of the children coming from backward communities. Taking a step further in the direction of educating the people from backward communities, he wrote a book called Aacharabhooshanam on the existing superstitions in the society. Under the government welfare scheme, this book was published and distributed free of cost to the people from discriminated communities. He was also instrumental in starting fishery schools to scientifically cure fish and promote the field of fisheries as an industry in the state. These reforms helped the fishermen community to develop as a whole. After 1932, he decided to quit the job of a teacher to devote full time to fight for the common good of the people. With this end in mind, he began to organize the people and established sabhas to dispel the notions about the superstitions in the society. Through these sabhas, he requested his fellow beings to get themselves properly educated to live in better conditions. Through his social work, he also wanted the emancipation of other communities too. For this purpose, he established Cochin Pulaiya Sabha. He waited for the right opportunity to prove his point. At such a meeting convened to inaugurate an exhibition on agricultural produce, he gave a speech to highlight the bad living conditions of the oppressed classes, especially those of Pulaiyas who cultivated these agricultural produce. The Diwan of Cochin at that time was attending the meeting. He heard what Pandit Karuppan had to say about the issue. Moved by the words of Pandit Karuppan, Diwan of Cochin ordered the organizers to allow the Pulaiyas to come and see the agricultural produce cultivated by them at the exhibition venue. From that point in time, the roads and other facilities in Cochin City were thrown open to the members of lower casts, including those from Pulaiya community. One of the significant works of the Pandit Karuppan was Baalakalesam. This dramatic work was written by him on the occasion of Shastipoorthi of Maharajah of Cochin in 1919. The drama was written by him in a short span of 10 days. Hence, Pandit Karuppan was very nervous about the plots in the drama, as it was set in the backdrop of the royal family of Cochin. In this drama, Baala was the Queen of Cochin and Kalesan was the Maharajah of Cochin himself. Through this work, dramatist in Karuppan sought to compare the living conditions of the people before and after the Maharajah of Cochin assumed the power, thereby highlighting the developments undertaken during his rule. Through this work, the author also tried to criticize the evils of the society and the suffering of the people due to them. Another notable contribution by him in the literary field was the writing of the poem titled Udyanavirunnu. This poem was penned by him to vent his anger at the authorities for not inviting him to a garden party in the honor of the visiting Governor of Madras. On that occasion, Karuppan was left out because of his caste. Pandit Karuppan was a social reformer, a dramatist, an academician, and a poet. He hailed from the Ernakulam district of Kerala. Most of his time was devoted to the betterment of the discriminated communities of the region. Karuppan was vehemently against the existence of superstitions and other wrong communal practices. For this purpose, he organized the meetings and told the people about the importance of having an education and a decent living in the society. When he became the member of the Cochin Legislative Assembly, he brought to the notice of the authorities the plight of the oppressed classes in the society. Due to a series of presentations, the Cochin government had to act and bring some landmark legislations to improve the conditions of the members of the backward classes.